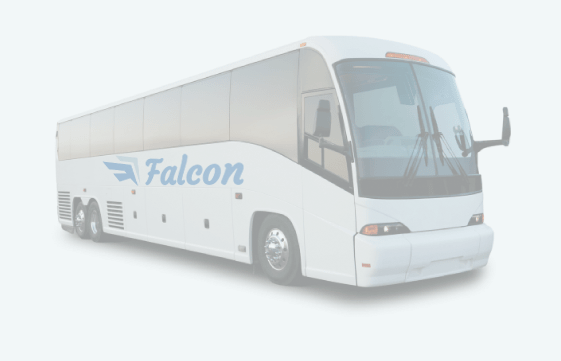 Falcon Charter Bus provides modern motorcoach rentals in major cities across the Southeast. With experience booking charter buses and minibuses for groups of every kind, we’re able to find you exactly what you need every time you call. We provide a myriad of unique transportation solutions for groups of all sizes across Florida, Georgia, North and South Carolina, and Tennessee. We’ve worked with every type of group, from wedding parties to sports teams to traveling businesses, giving us the experience necessary to give you the perfect travel experience for every type of trip. Falcon Charter Bus services the Southeastern United States, with a primary focus in major areas such as Miami, Tallahassee, Atlanta, and Charlotte. With 24/7 availability, we’re always here to find the perfect bus for you. By partnering with the South’s best bus providers, we have access to the highest-quality charter buses and minibuses available in the region. Our agents pay close attention to competitors, allowing us to bring you the best coaches at the best prices. We’ve worked hard to develop a network of the most modern, technologically-advanced buses on the market. By pairing them with the most skilled drivers in the transportation industry, we’re able to get you the exact solution you need for all of your travels. “Our group will probably never carpool again after using this company. They really showed me how simple it is to get around with a charter bus. Even public transit seemed better than a private bus, but now I’m not so sure." “Finding an effective way to get my co-workers to and from meetings downtown used to be horrible. But these guys made it really easy for me to get everyone to the same place at the same time. I love their support." “Charter buses seem like one of the less trendy options you have for getting around, but they’re actually pretty cool. Some of them have some really cool features. I never imagined having a TV on my bus."